I use Google Earth every single day. Its ever-changing wealth of information is intriguing and captivating. Today I'm launching the first weekly blog feature I've ever done, the Google Earth Image of the Week. Check back each Monday for a new image and discussion from around the world. Today's image comes from a place I have been thinking (and talking) about a lot lately, Somaliland. 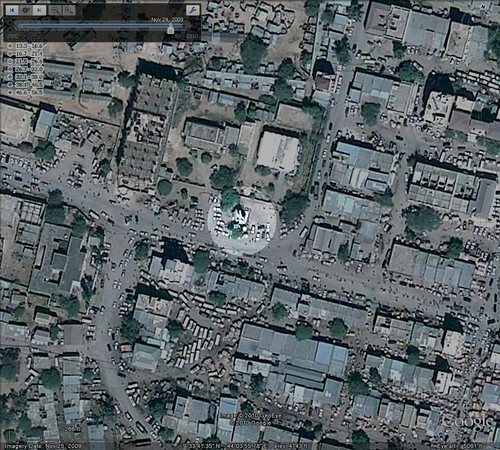 The highlighted area shows the location of a MiG jet in Freedom Square, Hargeisa. I know Somalia used its Air Force to bomb Hargeisa and areas of Somaliland, but I haven't found anything definitively identifying the jet in Freedom Square as a Somali jet shot down during the Civil War- which seems to be the most widely accepted rumor. If anyone has any info on the origins of the jet in Hargeisa, I'd appreciate you letting me know. For reference, you can locate this area in Google Earth at 9° 33'41" N, 44° 3'55" E. Also for your reference (and my own) you can type the degrees symbol on a windows based computer by holding the alt key and typing 0176.